6 Bdrm Detached Dwellhouse. Ground flr: V/bule. Hall. Lounge. Dining rm. 2 Bdrms. Breakfast kitch. Mezz flr: Bathrm. Shower rm. 1st flr: 4 Bdrms. Boxrm (CT band - F). Garden. Parking. Price over £310,000 Entry by arr. Viewing contact solicitors. (EPC band - E). 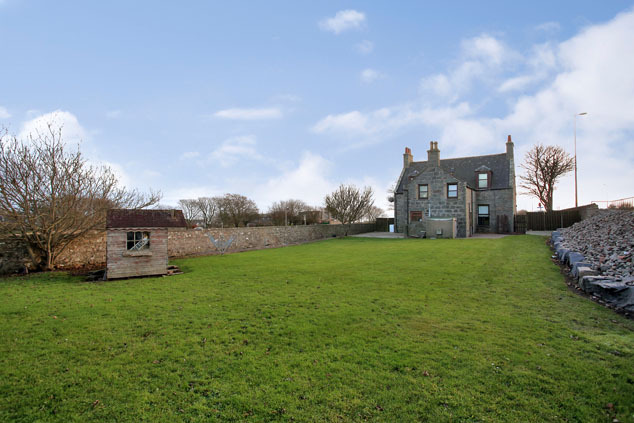 We are delighted to offer for sale this impressive stone built six bedroomed dwellinghouse retaining many period features located in the charming coastal village of Muchalls within easy commuting distance of the city centre. 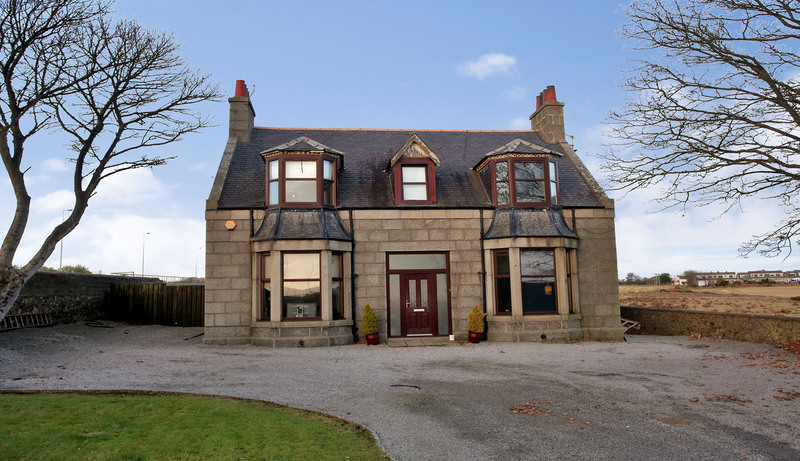 This traditional dwellinghouse, requiring some refurbishment offers extremely spacious accommodation, features double glazing throughout and is served by gas central heating. On entering, the vestibule with original Victorian Terrazzo tiled floor leads into the wide hallway giving access to all rooms including the twin lounges at the front both featuring bay windows, original wood mantels and high ceilings with ornate moulded cornicing. 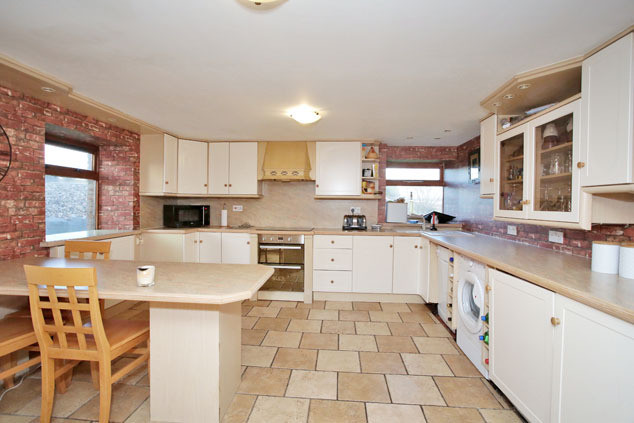 The spacious fully fitted kitchen and two double bedrooms complete the ground floor accommodation. An original carved wood staircase leads to the mezzanine landing with a large modern family bathroom with Jacuzzi bath and a well appointed modern shower room. 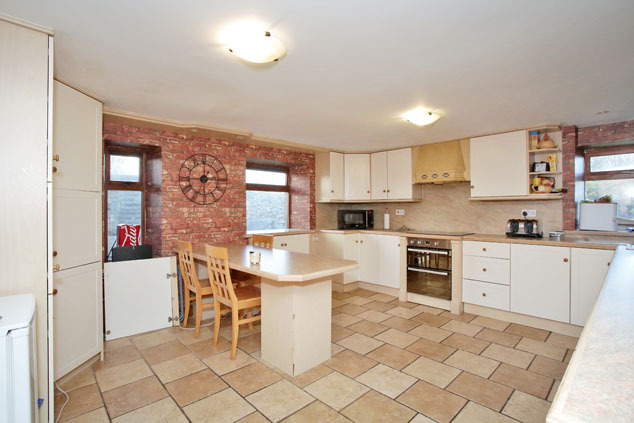 On the upper landing there are a further four double bedrooms and a box room. Outside to the front, there is a lawn and large driveway providing parking for several cars and to the rear the large garden is laid to lawn with mature trees and views across the fields. 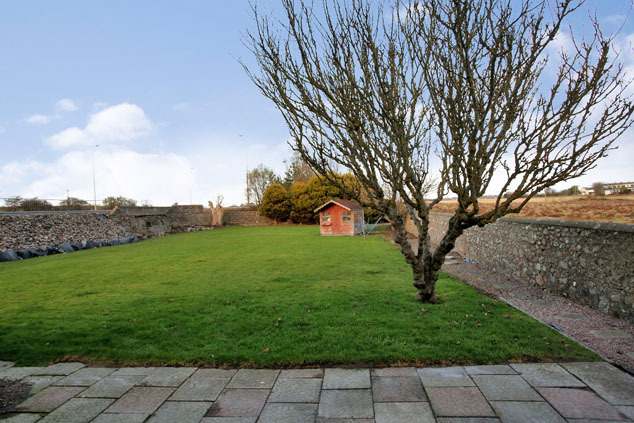 Viewing is recommended to appreciate the spacious accommodation and period features of this substantial dwellinghouse. Muchalls is a picturesque cliff top coastal village lying approximately 12 miles south of Aberdeen and 6 miles north of Stonehaven. Primary schooling is available at the nearby village of Newtonhill while secondary education is available at either Portlethen Academy or Mackie Academy in Stonehaven. Entrance Vestibule 6’10” x 7’3” [2.22m x 2.08m] approx. A wide exterior door with glazed side panels gives access to the large entrance vestibule with Victorian mosaic tiled floor. A glazed wood panelled door with glazed side panels leads into the hallway. Hallway 18’5” x 6’10” [5.65m x 2.08m] approx. at longest and widest The wide hallway provides access to all main accommodation and to the upper floor via the carpeted staircase with original ornate wood balustrade and provides storage in an understair cupboard. Lounge 1 15’6” x 12’11” [4.76m x 3.95m] approx. at widest The lounge is an impressive room with bay window to the front, original wood mantelpiece with alcoves to each side and moulded cornicing and turned wood decoration around the bay window with double height deep wood skirtings. Recently fitted venetian blinds. TV point. Lounge 2/Dining Room 15’6” x 14’0” [4.73m x 4.31m] approx. at widest This versatile second lounge could be utilised as a dining room. 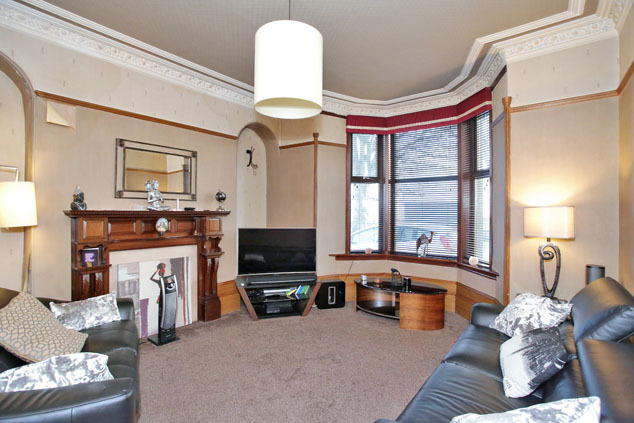 Requiring some refurbishment it mirrors the lounge also looking to the front and featuring a bay window, alcoves and original moulded cornicing and deep skirtings. The open fireplace is an attractive focal point with marble insert and carved wood mantle. Double Bedroom 1 12’11” x 8’1” [3.95m x 2.47m] approx. A good sized double bedroom looking onto the rear garden, there is a modern pendant light fitting and laminate wood flooring. There is ample space for free standing furniture. Double Bedroom 2 12’11” x 10’11” [3.95m x 3.34m] approx. 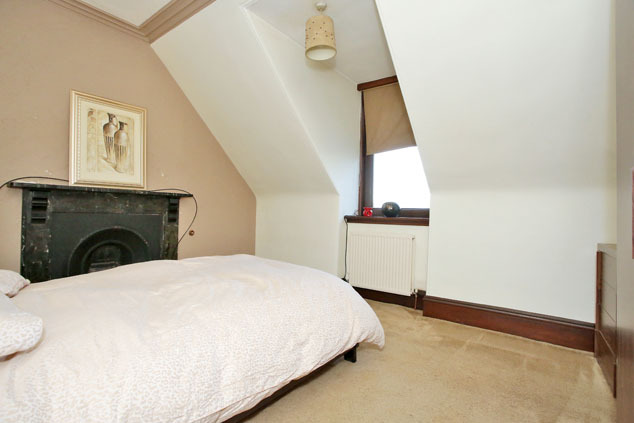 This second ground floor double bedroom also looks onto the rear garden and features an original fireplace. Kitchen 16’0” x 13’8” [4.87m x 4.16m] approx. Double glazed wooden doors lead into the generously proportioned well appointed kitchen, fitted with a good range of wall and base units in a light wood shaker style, corner sink and recently fitted electric double oven and hob and integrated fridge/freezer which will remain. There is a large fitted breakfast bar to match the stone effect worktops and neutral ceramic floor tiles. The remaining white goods are not included in the sale. A wood exterior door leads to the rear garden. Upper Floor/Mezzanine 6’11” x 6’7” [2.11m x 1.82m] approx. The carpeted staircase with wood balustrade continues up to this mezzanine landing which gives access to the family bathroom and separate large shower room and two storage cupboards one shelved for linen. 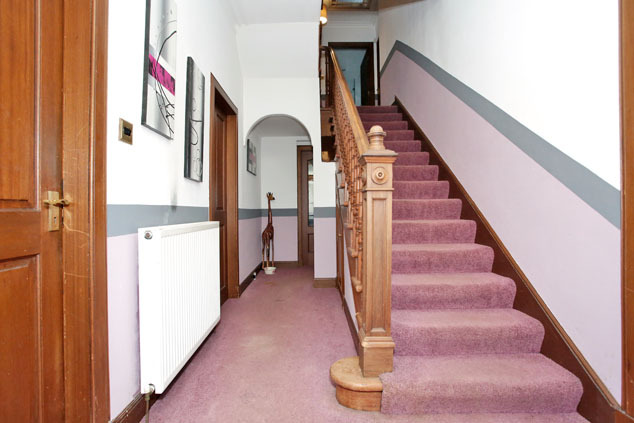 A further short flight of carpeted stairs leads to the upper landing. A stained glass roof window gives light onto the landing. Bathroom 12’4” x 7’2” [3.77m x 2.19m] approx. 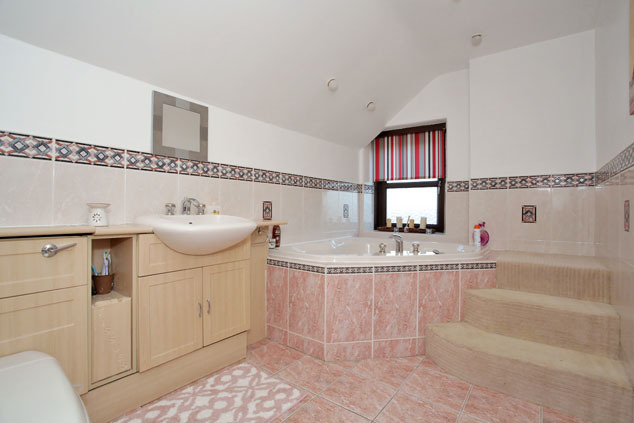 This spacious bathroom is fitted with a corner Jacuzzi bath with steps leading up, matching w.c. and wash hand basin set in a vanity unit with fitted storage. Co-ordinating tiling to dado height with decorative border and ceramic floor tiles. Opaque window to rear. Shower Room 11’9” x 6’4” [3.58m x 1.92m] approx. 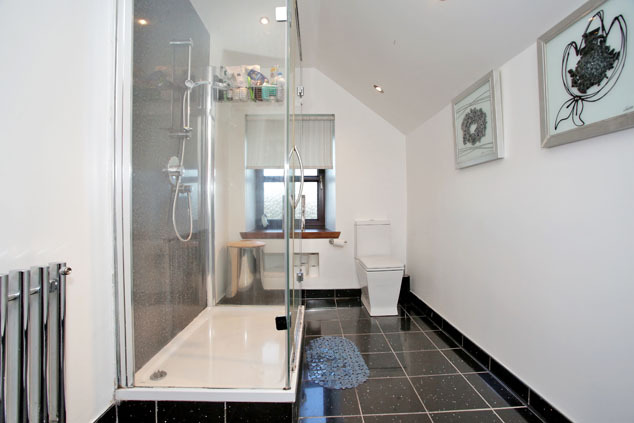 This stylish modern shower room is fitted with a large double shower enclosure with mains shower and white suite, comprising w.c. and wash hand basin in fitted gloss vanity unit with drawers and chrome handles. Contrasting black quartz floor tiles complete the décor. Upper Hallway 8’7” x 6’11” [2.62m x 2.12m] approx. The upper landing leads to four double bedrooms and one single bedroom and has an access hatch to the part floored loft with folding ladder. Double Bedroom 3 13’0” x 10’5” [3.96m x 3.18m] approx. 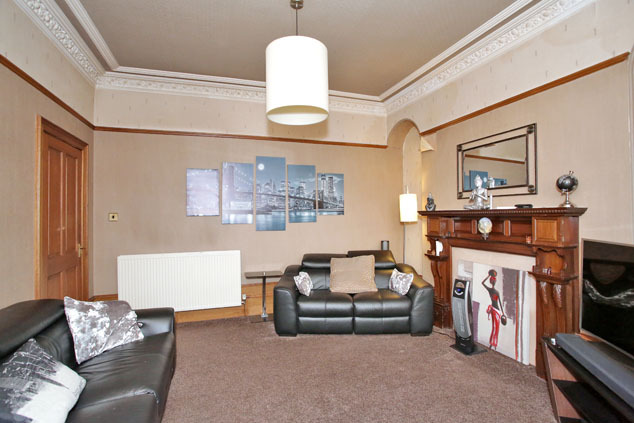 A spacious double room with original cast iron fireplace with marble surround, looking on to the rear garden. Neutral carpeting. Ceiling coving. Double Bedroom 4 14’10” x 12’11” [4.53m x 3.93m] approx. 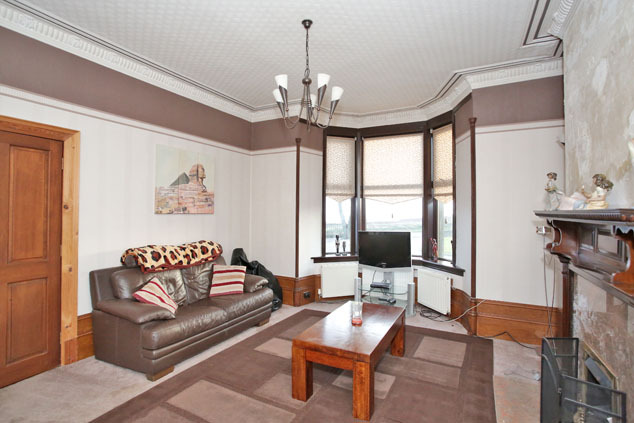 A spacious double room to the front, looking south towards the sea coast from the bay window. Ample space for free standing furniture. Double Bedroom 5 14’8” x 12’10” [4.48m x 3.92m] approx. A spacious double room located to the front with views towards the south and the sea coast from the bay window. Modern décor and neutral carpeting are complemented by the original ceiling coving. Double Bedroom 6 12’10” x 10’4” [3.93m x 3.16m] approx. 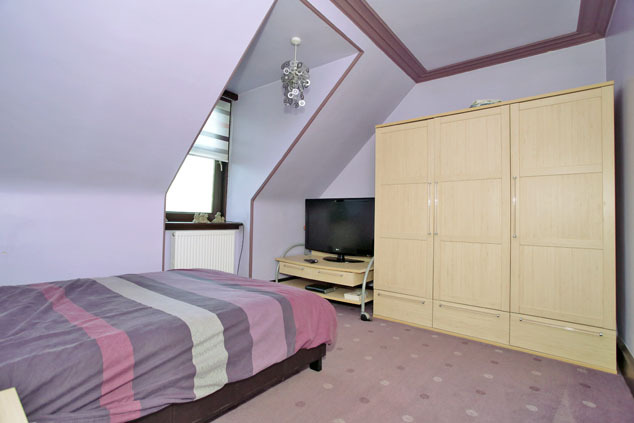 A further good sized double room to the rear with original moulded coving and ample space for free standing bedroom furniture. Box Room 6’11” x 8’4” [2.54m x 2.12m] approx. The box room overlooks the front and is laid with laminate flooring. A hatch gives access to the roof space. Outside The driveway and front garden are bounded by an original stone wall with cast iron railings. There is an area of lawn and a large stone chipped driveway with parking for several vehicles. To the rear the enclosed garden is laid to lawn surrounded by walls and mature trees. An outbuilding houses the central heating boiler. Directions Travelling from Aberdeen on the A90 take the first entrance in to Muchalls onto Dunnyfell Road and continue down into the village. Turn right into Marine Terrace and then left into Walker Drive. The Lomonds is the last house on the right hand side. Notes Gas central heating. Double glazing. EPC=E. All fitted floor coverings, curtains, blinds and light fittings are included in the sale. The electric double oven and hob and integrated fridge/ freezer will remain with all other white goods being removed. Items of other furniture are available by separate negotiation.